Data is what a data does. Entrapment. Use it for your advantage. Just one guy with a bag on his head. Demon Core is a first-person survival action game, a fight for freedom against an overwhelming enemy, featuring an edgy female protagonist; a scientist forced to take up arms when everything falls apart. 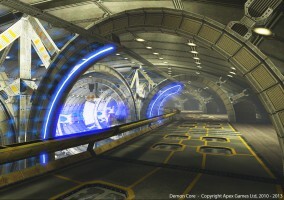 Aspects of the game are unique artistic style created with Unreal Engine 3, combining near-future high technology with exotic Russian design and innovative gameplay elements. There are some nice animation and VR related projects we’ve been doing lately. We are strengthening our skills in VR and the pipeline involved. It’s an interesting new media and there will definitely be some advanced applications also outside games. A lot of work has been done on the AI lately. We were not satisfied on some of the aspects of how the enemy AI was handling certain situations and reacting to the player’s decisions. Many parts of the logic have been rewritten, and the soldiers are starting to show some serious skills now. Apex Games Ltd is an independent game studio located in Tampere, Finland. We believe in delivering high quality and having a lot of fun doing it. In other words, we are dedicated to making our games awesome. Right now we are in the middle of developing a tactical shooter based on original IP called Demon Core. Non-stop action, top-of-the-line graphics and compelling gameplay elements are at the heart of our development.